Our newest block of the month is Foreign Language – designed by our very own Lynne Nostrant. 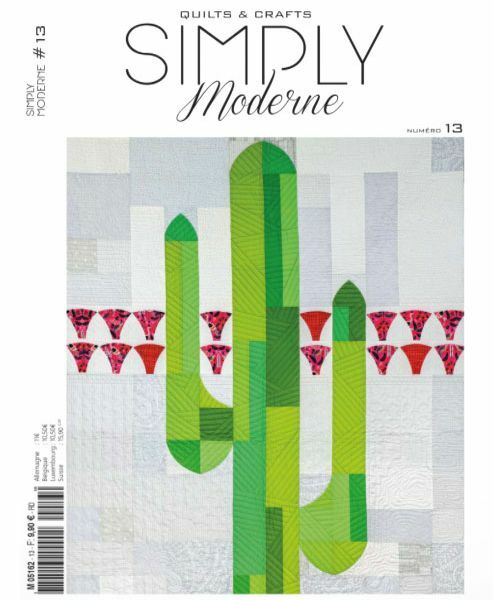 Lynne’s inspiration for this block was “Magic Inch Quilts.” You can see a tutorial from Bill Kerr and Weeks Ringle of Modern Quilt Studio to learn how to make similar blocks. Use the photos and instructions below to make your block. Bring your finished block(s) to the March meeting for a chance to win them all during the block lotto! 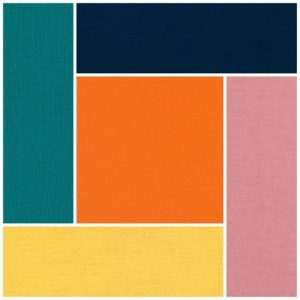 Start with a 7×10 inch piece of your solid background color: Sunflower, Navy, Persimmon, Rose, Emerald. 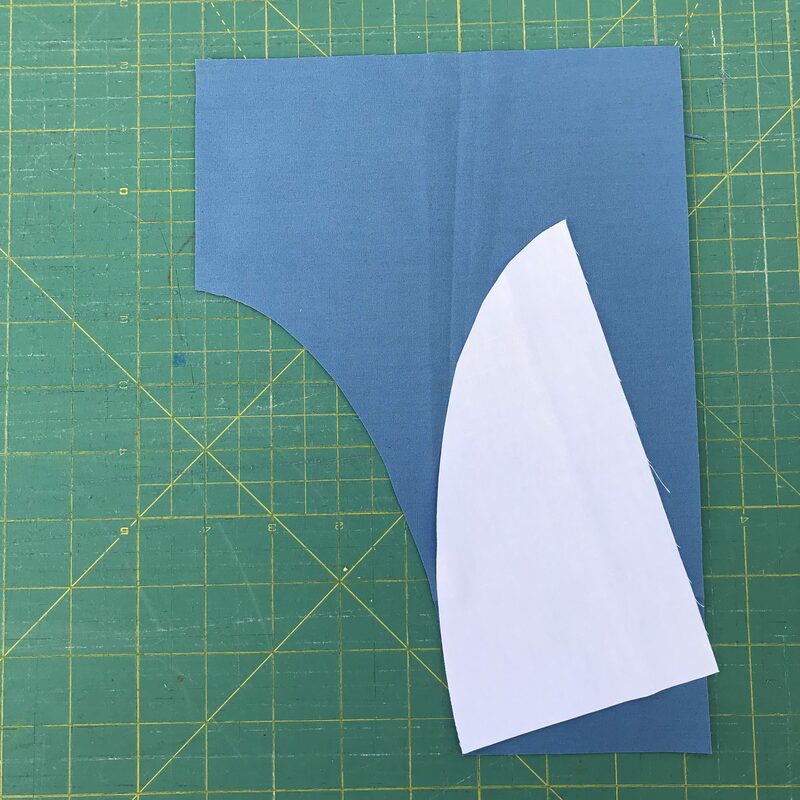 If you plan to make severely angled cuts or curved cuts, use an 8×11 piece as you will lose some when you trim. You will also need a one inch strip of letter fabric for each block. The length of that strip depends on how many cuts you make. Plan on one 1”x 40” for each block and you should be safe. Starting at least one inch from the sides, make between 1- 5 cuts in the background. (See examples) You can use a ruler or cut freehand. 3. 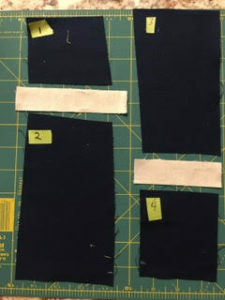 Label the pieces in your preferred manner, thinking about the order you will sew them together, as you will sew the smaller pieces together before the longer ones. 4. Using a one inch strip of the letter fabric (Kona Oyster), sew one side of the strip to piece 1, then the other side of that strip to piece 2. Repeat for successive pieces. Ironing the seam allowance toward the letter fabric will make the letters pop out of the background a little. 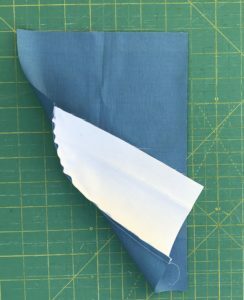 If you are using an accurate 1/4 inch seam allowance, your seams should exactly meet in the middle when pressed flat on the back. 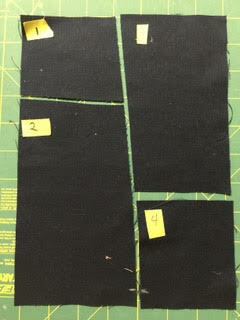 Note: If you will be using curved piecing, you must cut your letter fabric on the bias or your blocks will not lay flat. After pressing, trim your block to exactly 6.5 x 9.5 inches. 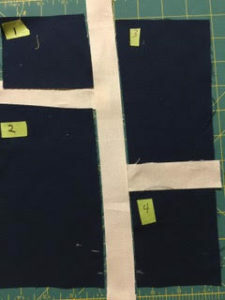 Use painter’s tape for numbering your pieces, always placing the number in the upper left of the fabric for orientation. Just don’t sew or iron over it! For complicated piecing with several cuts, take a picture with your phone for reference. It can be confusing, especially with solid fabric. 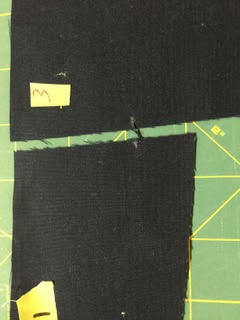 Registration marks in the seam allowance help to line up pieces for angled or curved cuts. You can use a 6.5 inch wide ruler for the first trimming to easily trim both sides. Then turn it and have a straight line to use for finding the 9.5 inch mark. If you find that your block is a little short, just add in another one inch Oyster strip, followed by at least one inch of your background color. The end of the year is celebrated the same way every year by our guild. We take the first part of the meeting to have our showed and tell. As is always, our members showed us their many talents. Claire says she is a modern quilter from a traditional guild – all we know is that she made a beautiful quilt here. Pam brought in this small quilt which is one of many where she works with one shape and repeats it. Laura Ryle made this gorgeous modern Amish quilt as a wedding quilt. Laura did the quilting as well. Tamlin made this geometric vision of a mountain scene in this quilt which she will be gifting. After show and tell, we had so many great treats that members brought for a bit of festivities and to enjoy each others’ company. We then had a fun gift swap and everyone was so generous and creative with their gifts. We also brought many donations of fabric and notions for survivors of the camp fire and for members of a quilt guild there whose members lost their homes. Quilters in that area have requested fabric, needles so that they can do hand work while they start to rebuild their lives. As we all know, having a small but creative outlet is soothing and helpful. We will see you in 2019!! Hi Beautiful Guild members! We had our November meeting and here’s some highlights. First, the recipient of the Block of the Every Other Month is Ruth. She received all the blocks that were made pictured behind her. Ruth @scarletbegonias633 was the lucky winner of the BOTEOM lotto drawing. The pattern, Echo Block Study, by @capitolaquilter is available on the #mqg website. Our own Karen designed the Echo Block Study and is found here on the MQG website. We then announced the next BOTEOM with Pam’s tutorial on how to make it. Pam Rocco introduced the December BOTEOM pattern, Water Slide, and gave us a demo. The pattern will be available on the blog. Pic 3 shows the the triangular flag you need to establish correct alignment of the curves. Here is Isabelle with a sample block. Isabelle @southbaybella introduced the color pallet for the BOTEOM due at the December meeting. Swipe to see how much fun we have at our meetings. The pattern is “Water Slide” by Pam Rocco. Here is a link to the directions along with the color palette. More copies of the templates will be available at the December meeting. We had plenty of member show and tell as well. Mickey @mickeybeebe shared another wall quilt with an architectural theme. Jeannie showed us her quilt made of shot cottons, designed by her. Jeannie @landjeannie shared a top featuring her original block design, “Maze”. 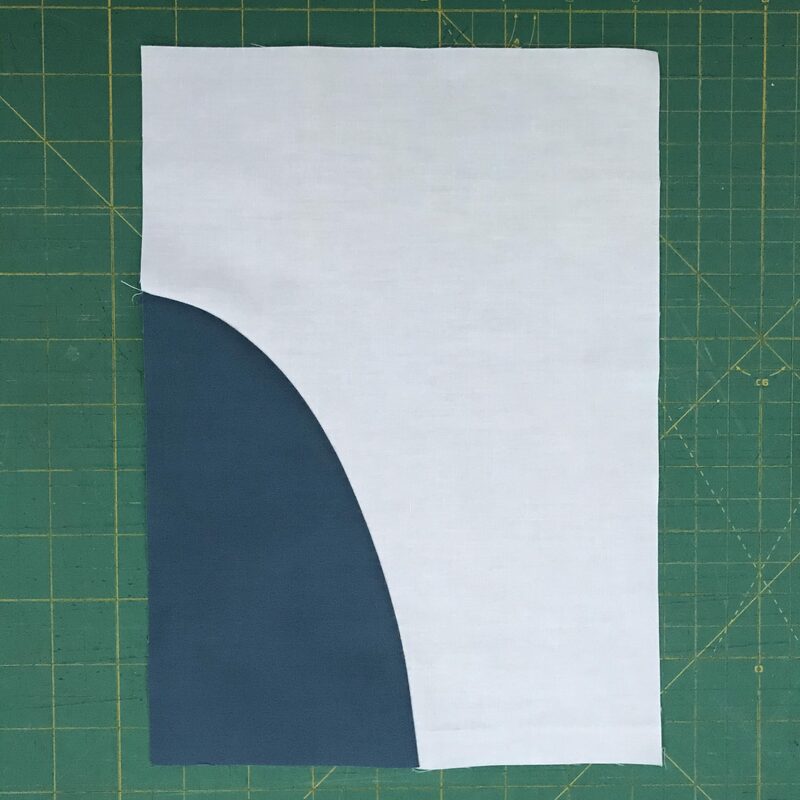 Our #SBAbbey consultants recommended curved/organic quilting. Laura @laura.ryle picked a beautiful color palette for this Amish inspired top. VP @darlenetalukder hiding behind her spooky Halloween quilt at tonight’s meeting! @anna_brenk Anna quilted her orphan block quilt by connecting the centers of the flowers on the backing fabric (pic 2) A close up of the resulting pattern is in pic 3. Anna @anna_brenk shared the quilt made for her daughter’s wedding. The pattern is #octagonshimmer Swipe to see a closeup in pic 2. The quilting is striking on the Moda grunge (in peacoat) back in pic 3. Kathryn @katbsharp completed this baby quilt using guidance from the book Walk. Pic 2 shows the straight line stitching starting at the center block and expanding to the edges of the quilt. Kathy is making this quilt by layering different colored fabrics together and then cutting into the layers – creating this effect. She embroidered the bird as well. We hope you’ll join us for our holiday celebration meeting, December 4th at 6:30. See you there! Our newest block of the month is Water Slide, designed by our very own Pam Rocco! Access the Water Slide Templates and basic instructions written by Pam Rocco. Print the templates for use while making your block. Make sure your printer is set to print with no scaling, or 100% scale to ensure the templates are the correct size. Use the photos and basic instructions below to complete your block. 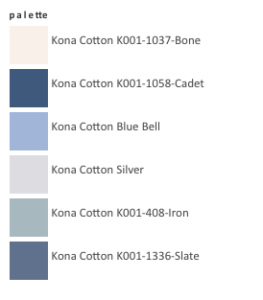 Our color palette for this month is Arctic Winter. 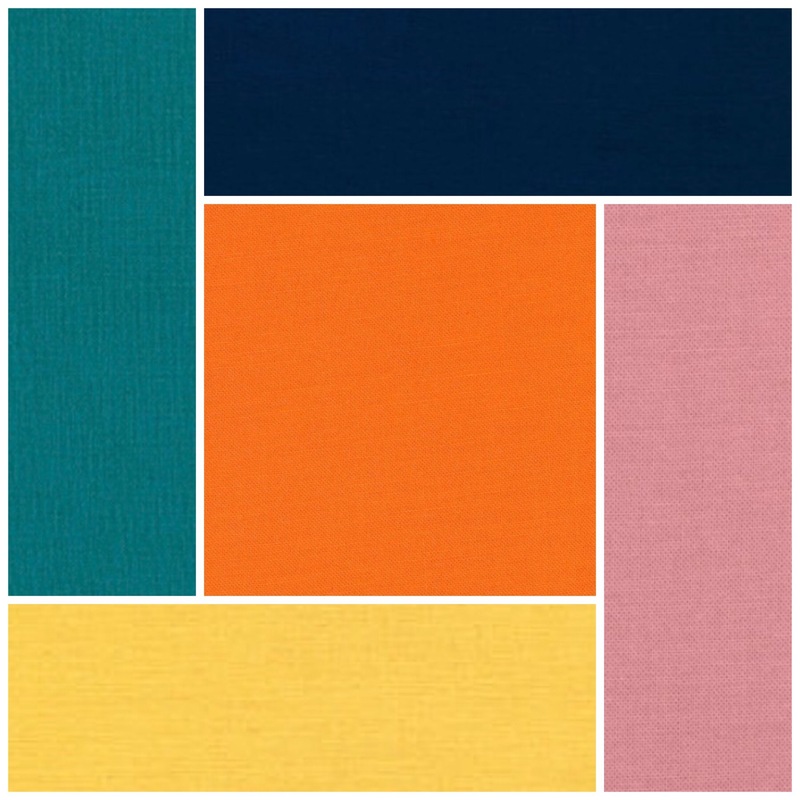 Use solids or prints from the color palette below. Bring your finished block(s) to the January meeting for a chance to win them all during the Block Lotto! Using the templates linked above, cut your fabrics for one or more blocks. Be sure to add 1/4″ seam allowance on all sides when cutting your fabrics. 2. Place piece A and B right sides together and sew along the curve using a 1/4″ seam allowance. 3. Press seam to either side. Congratulations! You’ve completed one block. 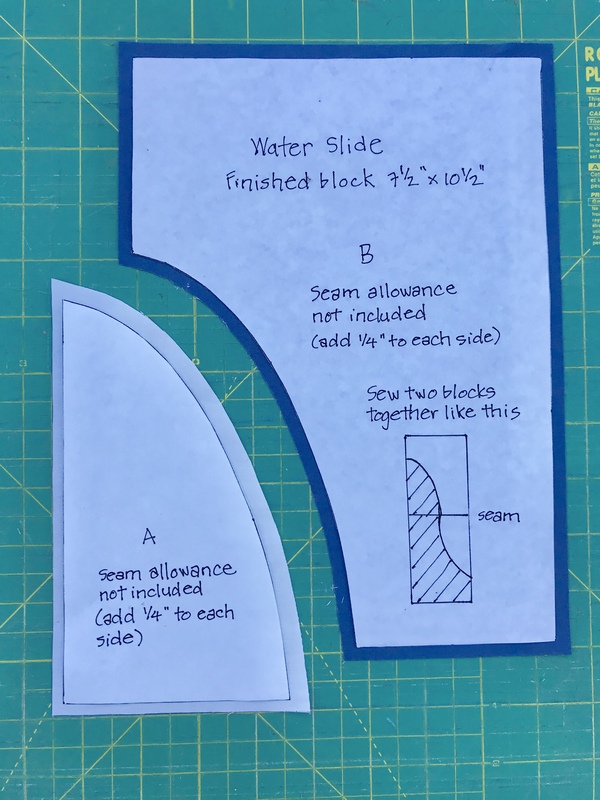 Please do not sew blocks together as illustrated on the templates page. We look forward to seeing your blocks! The 7th Annual has came and went…many, many months ago! It’s not too late, however, to think about the fun we had last year in anticipation for our 8th annual retreat coming September of 2019! The Happy Valley Conference Center hosted us again this year. We were close to Santa Cruz but felt so far away. We were able to spread out and sew, eat delicious food, and enjoy our creative community without interruption. Thank you for Lori for organizing games and adding a little friendly competition to the retreat! We have such a supportive community. Here a few members discuss layout and share creative advice. Lastly, thank you to our sponsors! We couldn’t have done any of this without you! Can’t wait for our next retreat! Look for an announcement soon! !